I recently joined a running club here, called London Heathside. It was a really good choice; for a minimal annual fee, club members have access to 6+ workouts a week. In addition, there is a budding sub-group of triathletes within the club, so they’ve started doing Sunday cycles and weekly swim sessions. I’ve been running with the Tuesday evening road/woods-running group, which typically does 10-12km through Highgate Wood and Alexandra Park, sometimes adding intervals in the woods. On Thursdays, I head to Finsbury Park for mid-distance speed sessions on the track. We typically do 3 sets of 800m breakdowns at 800m pace with 5 minutes in between each set. For example: set 1) 500m + 300m; set 2) 2x400m; set 3) 4x200m. After the main sets, our coach, K, usually throws something quick and fast at us, like 8x60m with a rolling start. I don’t always finish the entire workout, but I love the Thursday track sessions; the group is really great and everyone supports each other while maintaining that slight competitiveness not uncommon among runners. 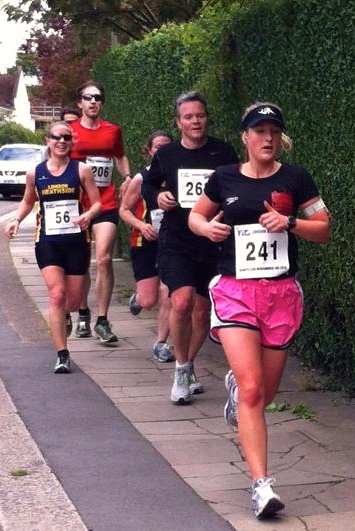 The race was the Hampstead Midsummer 10k, organized by my club. It required three laps of the roads around London’s Hampstead Heath Extension. In the week before the race, I strategized over and over in my head, trying to think about how best to approach the race and run it well without burning out after the first 5k. I decided to split the race into thirds, which worked well because the race was three laps. So each lap, I figured, was around 2 miles; my generous goal was to finish under 50:00, so I knew if I could run under 16:00 for the first lap and be under 32:00 after the second lap, I’d be able to finish in the time I wanted. F was also running his first 10k and, as he was a bit nervous, said he’d try to stick with me as long as he could. I also knew that two of my track training buddies, C and J, were running. C is typically a smidge faster than me in workouts and parkruns, while I am usually just ahead of J. If I could keep those two in my sights, then, I knew I’d run a decent race and meet my goal. I saw them both before the start and we chatted a bit about times; C was aiming for 45:00, and J had run this course in 47-something. Did I mention this was a hilly course? It had 150 meters of climbing in total, and we had to tackle the same hill, which had to have been at least 1km long, three times. Granted, we also got a nice downhill on the backside of the loop (and luckily that’s the side we finished on), but it was a tough course. The start of the race was slow, but I was able to follow J as she weaved through people to get out of the initial congestion. I settled in and kept her in my sights; I eventually saw C up ahead as well. The first kilometer passed quickly, and I passed the marker at 4:26 on my watch — well under my goal pace of under 5:00/km. I knew I’d be fine if I could just maintain that pace. Luckily, I caught up with C somewhere between kilometers 2 and 3 and we settled into a nice pace together. F had caught up with me by this point, and he tucked in right behind C and me. We passed through 3km in 14:00 and started the second lap as my watch showed 15:00. No problem, I thought, just stick with C and you’ll finish well. We caught up with J just before the halfway point, and formed a pack of three Heathside women (all wearing our snazzy navy, red, and yellow singlets) plus F in his red shirt. One of the marshals called us a peloton as we rounded a corner together. Strangely, there was no 5km marker — the only one missing — but we went through 6km in under 30 minutes (I think) and started the final lap at 30:45 or so on my watch. With J leading our pack by a step, staying together on the narrow, somewhat uneven sidewalks became tricky without tripping each other up. Through 8km in just under 38 minutes, I knew I could finish the last 2km in under 10 minutes, even though my legs felt heavier and heavier. But I knew that the last 1.5km or so was downhill, so I tried to lean into it and let gravity help me pick up the pace. Between 8 and 9km, my pack caught up with another woman, wearing black and pink. We knew we were all in the top 10 for the women, though we’d gotten different counts from different marshals. “Let’s catch her,” I breathed to C and J as we headed toward 9km. “It’s too early,” said J. Somewhere just before or after 9km, I was starting to struggle to keep up with the others, but F said to me, “Come on, Tamm, you can beat them.” That was all I the encouragement I needed to grit my teeth and hang on for the final 4-5 minutes of the race. I surged ahead of C and J, effectively taking charge of our pack; when I glanced behind I noticed that we’d dropped F going down the hill (he later told me he’d gotten a cramp — no fun). All that was ahead of us was that woman in black and pink. Glancing at my watch, which read 44:40, I knew that I only had half a kilometer to go and that once I turned onto the grass, it was just 200 meters to the finish. Setting my sights on black-and-pink lady, we rounded the corner together and I pushed to keep pace with her on the narrow trail. We made a final turn onto the grass and, with the finish line in sight 100-something meters ahead, I tightened up my form and used my arms to get my legs up to kicking speed. I shook off black-and-pink, caught one guy, then pushed as hard as I could to pass one more guy just before the finish. Final finish time: 46:30! That’s 7:30/mile pace, or 4:39/km pace for you metric-minded people out there. I was the 8th woman out of 62, and the 63rd runner out of 200 finishers. I’m pretty pumped about that, for my first “real” (not counting parkruns) road race in a while. But I certainly owe a lot to C and J for the fantastic pacing; without them, I’m sure my race wouldn’t have gone so well. Thanks to my body, too, for holding up and not cramping while maintaining a pretty decent pace for 10 kilometers. 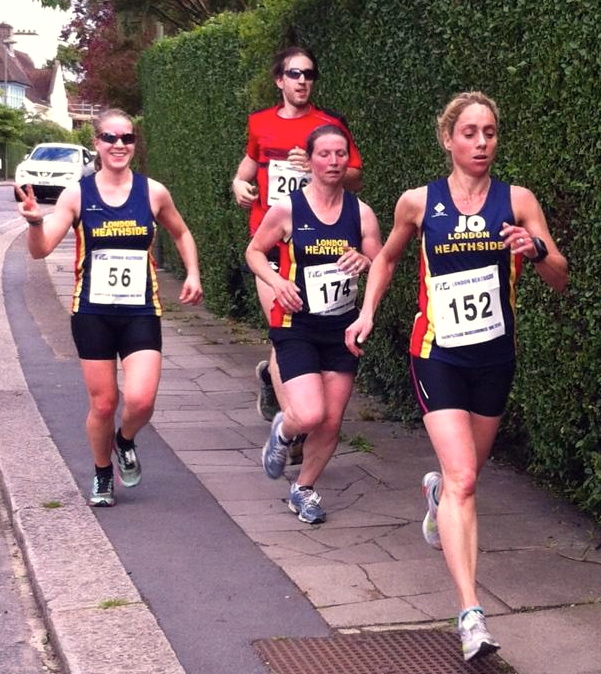 This entry was posted in community, exercise, health, Highlights, pictures, Race Recap, running on 23.06.2013 by taplatt.